For borrowers looking to put more control into the process of buying a used auto from a dealer, a blank check auto loan represents an alternative way to get financed by going through third-party lenders instead of letting a dealership set financing and interest rates. There are several ways that a blank check auto loan can benefit shoppers, with the first essential idea being that the financing terms and rates are already set before a prospective car buyer goes shopping on the dealer's lot. What are Blank Check Auto Loans? Blank check auto loans are loans that prospective car buyers take out from banks or other third party lenders before visiting a dealership. A bank car loan that is pre-approved for a certain amount is called a "blank check auto loan" because the buyer can use it just like a check at a dealership. Essentially, a bank car loan means that a buyer will not have to seek financing help from the dealer. Although it may mean that the loan value exceeds the value of the car, the blank check auto loan is popular in car shopping because so many dealers like to mark up interest rates. This is sometimes called "dealer reserve" and is worked into the purchase price. Other times, dealers will take advantage of customers with poor credit. All of this can be avoided by getting a blank check auto loan from a third party before shopping. Additionally, blank check loans are not available for commercial vehicle, motorcycle or recreational vehicle purchases. The vehicle cannot be more than 7 years old or have more than 70,000 miles on the odometer if used. Individual lenders will have different sets of criteria determining an individual's credit worthiness. An important tip would be to obtain a personal credit report to check for any adverse entries that you might be able to correct before beginning the process. Many experts will tell first-time car buyers and consumers that it is often in their best interests to go through a lender such as a bank or an employer's credit union rather than to rely on a dealership for used auto financing. This is because lenders who know the borrower can often get reduced interest rates to make a loan more attractive. This is true in a range of credit situations, from the ideal good credit situation, where an individual can negotiate very low interest rates, to a situation where a consumer faces additional risk factors because of bad credit. Banks and similar lenders are a lot better resources than dealers for giving consumers "pointers" in how to repair damaged credit for a chance at lower interest rates. 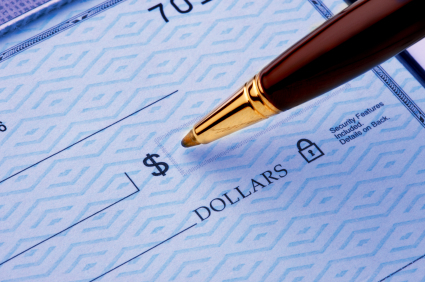 What Are Some Blank Check Loan Benefits? One of the good things about a blank check auto loan is that the amount being financed is already set, so that the buyer has a price range in mind when visiting the dealership. Without this kind of price range in place, a prospective buyer is in danger of being upsold and agreeing to purchase a car that costs more than that buyer can afford. Another thing about the blank check auto loan is that the interest rate has already been set, so that in the complex process of buying a vehicle, this additional complexity can be taken out of the equation. A lot of buyers who may have to look at multiple car lots to determine the best bargain can rest easy knowing that with a blank check car loan, much of the difficult financing process is already taken care of. They can apply these already known factors to any vehicle that catches their eye on the lot. A blank check auto loan can also be a great bargaining tool for telling the dealership exactly and specifically what a buyer wants to pay. Furthermore, obtaining a blank check loan locks in your interest rate allowing you to shop without the extra added pressure from daily rate fluctuation. Also, your financing approval is based on criteria the lender sets examining your credit worthiness and not based on the car's price tag. It relieves you from any frustration or anxiety attempting to possibly finance a vehicle that your lender ultimately believes is beyond your financial reach. Also, the blank check loan amount can also include all taxes, licensing and registration fees and other contract costs like credit insurance, warranty and service contracts plus other fees. Not all lenders will be willing to make a blank check auto loan. In fact, many outside lenders like to know what vehicle they will be financing before making an auto loan deal. This is an alternative for some buyers who may not be able to find a blank check auto loan, but for those who have no idea what vehicle they will ultimately be purchasing, looking around for a blank check auto loan is worth the time and effort. Many used car buyers want to finance a vehicle before they buy (in fact, even before they step onto the lot) and blank check auto loans are one way to accomplish this. For borrowers who qualify for a blank check auto loan, there are some definite pluses to going this route; however, there are also a few things to look out for in using a blank check auto loan to finance a used car purchase. The first is that bad credit can sink a buyer who applies for a blank check auto loan. Many lenders offering this kind of service require decent credit, and if a consumer's credit is less than stellar, they can be denied, and then it's back to square one. Many lenders like to know as much as possible about the vehicle they will be financing, and so it is generally not in the best interests of a buyer with poor credit to hold out for a blank check auto loan. Another danger in blank check auto loans is that in some cases, the buyer may not encounter enough of a face-to-face briefing situation with the lender. Some lenders offer convenient blank check auto loans through online sites or similar tools, without an in-depth, rigorous process to educate the buyer about their responsibilities. Although blank check auto loans generally carry fixed rate financing, where the interest rates cannot jump according to the market, a buyer still needs to be as knowledgeable about the interest rates in terms of their loan as possible. A buyer shouldn't think of the total amount of a car loan as anything less than a financial responsibility that has to be paid back promptly in the agreed-upon monthly installments. One other issue with a blank check auto loan is how it can influence a deal going down at the dealer's lot. Although the blank check auto loan does provide for a less complex haggling process in terms of financing, it can also have the effect of pinning the buyer into a fixed price situation, something that can result in an up sale which the buyer can't afford. The dealer may also try to "match" the amount of the blank check loan with a vehicle that is actually valued at a lower amount. To avoid this kind of situation, it's a good idea for the buyer to be as close-mouthed as possible during the shopping process, avoiding going into detail about the actual financing that has been arranged until it's time to close the deal. This can be tricky, as the dealer representative may be very curious about financing procedures. A buyer should let sales staff know that financing options are in place. One option for dealing with these liabilities is to mix a blank check auto loan with a down payment. This has two upsides: the first is that a down payment minimizes the amount that needs to be financed, so that over the term of the loan the buyer pays less. The second is that a buyer can use the combination of a possible down payment and a blank check auto loan amount to be a little more flexible in terms of a vehicle's total cost during the shopping process. Many banks and lenders now prefer you to get your financing done before you ever go to the dealership. Therefore, they make the application and approval process for these types of loans fairly simple and straightforward. If you have good credit, blank check auto loans will be no problem to find. In fact, if you have excellent credit, you may have received offers in the mail or in your email already. Usually, getting blank check auto loans is as simple as determining which vendor you want to use. You should always do some comparison shopping and try to get the best rates and terms available to you. Websites like CarsDirect make it very easy to get great rates on blank check auto loans. In fact, you need to only fill out a single page application and click the submit button. Once CarsDirect receives your application, they will check your credit and respond to you with several low interest rate offers within a few minutes to one hour. CarsDirect works with multiple lenders that help people with a wide range of credit histories. And like all other banks and lenders, they particularly cater to those with good or excellent credit. People with excellent credit are a lower risk; therefore, the banks and lenders are willing to offer them their lowest rates. Before you go shopping for your next pre-arranged auto loan, you should take the time to consider a few things about your personal finances: your current monthly income and present monthly obligations. Regardless of your credit history, whether it be good or bad, banks and lenders will always look at your ability to repay a loan. In fact, your interest rate will almost always be based on this fact more than others. If you can realistically only afford a $400 month car payment, then don't apply for a loan amount that will require a $500 or $600 month payment. While the bank or lender may actually approve you, they will usually charge higher interest rates as they will factor you may have problems later. Alternatively, you may consider also offering the bank or lender a larger down payment. When you make a larger down payment, the bank's risk is reduced; therefore, they will almost always offer you a lower interest rate. When you apply for your loan, you should try to make sure that the bank or lender is aware of this by including your intention to make a large down payment in any 'notes' or 'comments' fields in their application. If the website does not have a way for you to enter additional comments, then make sure that you inform the lender as soon as they contact you. The best place to look for blank check auto loans with bad credit is on the Internet. Many lenders looking to tap into this particular market have gained an online presence to access a broader base of potential customers. Before checking out either an online or traditional lending source here are a few things you should know. Know the score. First, find out what your credit score is from one of the 3 reporting agencies-Experian, Equifax and TransUnion. A score of less than 650 will indicate that you'll be paying a higher rate if approved. There are quite a few blank check auto loan sources that establish high rates and lending policies specifically tailored for people with fair to poor credit ratings. Fix it. Secondly, if possible, correct any small credit problems and fix any inaccuracies existing in your report, as this can help to raise your credit score. Larger down payments reduce interest. Next, you might want to consider adding to your down payment. Since the value of the car you are purchasing becomes collateral for your loan, the bigger your down payment, the more financial "stake" you'll have in the vehicle. Also, if available, using a "co-signer" can help in the loan qualifying process by reducing rates and lessening restrictions. Loan limitations. Keep in mind that when qualified, you will be limited to purchasing a vehicle that costs at least $7,500 and has no more than 70,000 miles on the odometer, if used. Also, most lenders limit the purchase to personal vehicles like an SUV, pick-up truck or automobile. Most lenders will not finance a motorcycle, commercial or recreational vehicle. Additionally, your purchase may be limited to a list of dealers selected by the lender. Buy out of pocket. Although your interest rate might be higher than that accompanying a prime loan, a blank check auto loan allows a consumer with bad credit an opportunity to purchase a vehicle that without this loan may never be available. Since the lending institution will set a maximum loan amount based on their determination of your credit worthiness, you will shop for a vehicle that has a pre-determined price tag and not run the risk of the car you sorely desire coming with a price your lending institution will not authorize. Pre-approved reduces stress. Lastly, searching for your blank check auto loan online will save you a lot of the time and heartache that accompanies many experiences with dealership financing. Every dealer has their own F&I departments where salespeople actually make more money off finance packages, service contracts and insurance programs tacked onto the price of the vehicle. By getting pre-qualified at a particular maximum amount, you can avoid the stress and anxiety suffered at the hands of high pressure sales tactics. Investigate the possibilities. Additionally, using online application services allows you the flexibility to investigate many more blank check auto loan sources than time and geography would otherwise allow. Also, many of these websites offer "account" features where registered users can store information and return at a later time to retrieve what was saved. Blank check auto loans have requirements similar to any typical auto loans. There are some basic requirements and these include that the car must be at least worth $7,500. Most lenders will only allow you to buy your chosen car from an authorized dealer, not independent used car dealers or private party sellers. There are some exceptions but check with your blank check lender first before starting to shop.